Had things worked out differently for James Tarkowski he might have been heading to the World Cup with Poland, but the Burnley defender insists he feels as English as bangers and mash. Tarkowski joined up with the Three Lions for the first time this week ahead of friendlies against Holland and Italy, having turned Gareth Southgate's head with a season's worth of impressive performances in the Clarets backline. The 25-year-old did have another route into international football thanks to his grandfather Boleslaw, who was deported to Russia in World War Two and went on to operate tanks in the Polish Free Army, but never fully embraced the idea. England and Poland are slated for a possible last 16 clash in the World Cup but there will be no split loyalties on Tarkowski's side. "I've always seen myself as an English person so to play for Poland would be difficult," he said. "I know that side of the family, it's not something I've never thought of or people I've never spoken to, but I've always seen myself as English. "It's only really the name that's followed me around." He speaks no Polish and his reply to a question about inherited culinary tastes was even more telling. "Sausage and mash," he offered with a smile. Tarkowski admits the only contact from Poland was tentative and tangential but faced a more forceful push from one of his cousins, Pawel. "There were a couple of conversations with people not at the top of the Polish FA but a couple of people associated with them, mentioning would I think about it and would I look at it?" he said. "At times, throughout me career, I've thought about it but I always saw myself as English so that was the most important thing. "I do speak to my cousin Pawel quite a lot, we share the same name, so he'd like me to play for Poland but once I got the call-up he sent me a message saying congratulations." The former Brentford and Oldham stopper has flourished at Turf Moor under the guidance of Sean Dyche, who has also nurtured the likes of Tom Heaton, Jack Cork, Danny Ings, Kieran Trippier and Michael Keane on their way to England recognition. 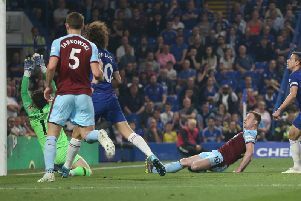 Tarkowski credits Dyche, a hard-bitten lower league defender in his own playing days, with adding a no-nonsense element to his game. "He (Dyche) has probably changed my style a little bit," said Tarkowski. "People have written that I'm an 'old-fashioned English defender' but before I joined Burnley no-one ever said those words about me. I was more a ball-playing centre-half as you'd say these days - playing out from the back in a Brentford team that was expansive, open and took a lot of chances. "When I went to Burnley it sort of flipped it on its head, we take a lot less chances but do the basics right. Doing the defending - the most important stuff - right, that's what I'm there to do." He also owes much to Keane for a less intentional helping hand, first vacating his place in the Burnley side with a £30million move to Everton and then for failing to bring his best form to a turbulent season at Goodison Park. "Sometimes when people join places it's not so easy, so I've been fortunate some people have gone to clubs and not done so well," he said. "Keano was terrific at our place and from what I've seen he's a top-class player. I'm sure he'll be back in the England set-up at some point."